It's not acceptabe outside Stormont, so why should politicians be able to get away with such childish behaviour? John Cunningham speaking at the launch of efforts to devolved corporation tax to NI. "It’s like watching children argue, arguing at school. What relevance does it have? Why don’t they put it all behind and really look and address the problems that we’re facing... They’re only going to keep us in the past. They’re not going to keep our young people at home. They’re not going to put prosperity into the Province." For John Cunningham the proper way is all about looking forward and the future. He said, "If this place is to survive and prosper it needs to look at things in a new way." He also said that any institution which is locked in the past is irrelevant. Jeffrey Peel wholly agreed. He said that, "Cunningham’s frustration with the nonsensical, circular squabbles of tribal politicians is absolutely on the nail, of course. If we consider for a moment what is accepted of civil society, the behaviour of Stormont politicians is neither justifiable or tolerable. If we are to create a shared country we need diplomatic statesmen. The basic premise of democratic society is that politicians will necessarily have to work and govern alongside men and women they don't see eye to eye with. Democracy therefore requires open and workmanly relations. Politicians who can actually talk and show common courtesy and decency to other lawmakers. Politicians who can compromise and make arrangements. It's not OK for our politicians to be uncompromising, intransigent, belligerent, indignant and obstructionist. Why does everything have to be made personal? Students at college and university would never get away with rude and incivil behaviour. People in business would never get away with it. Students and workers have to pass rigorous character and personal assessments and stand by a strict code of social norms if they want to move up in their career. The highest standards of conduct are expected and nothing less is accepted. The kind of incivility, childishness and babyishness that characterises Stormont would never be accepted anywhere else, so why should it be OK for Stormont politicians to behave like children? Not only does this mean bad government, but it also alienates the normal, functioning sections of society who see no relevancy in the political forum. 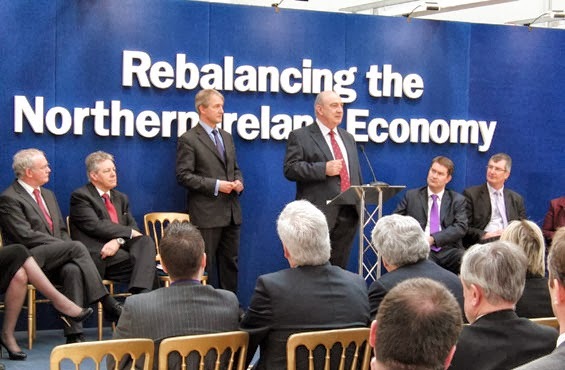 As David Trimble said, "The 'Garden Centre Prods' are appalled by the amateurish nature of our present devolution." The same applies to Catholic no doubt. Not that religion matters. The most functional people in society don't vote which, as Mick Fealty said, is "as good as an approval, albeit a lukewarm one." And so the negative feedback loop continues. The congress of clowns sustains itself by its very childishness. We need politicians who don't make everything personal and who don't forever live in the past but who care about the present and who, against a backdrop of rising youth unemployment, healthcare uncertainty and a failing economy, feel the fierce urgency of the now. I was once ranted at by an old North Sea tiger whose decades of experience had led him to the conclusion that one would "never find a captain of industry who had cut his teeth in the oil industry..."
What he meant was that the bungling powers that be who controlled the oil money where saved by the sheer voodoo of having a geology shamen point to the part of the earth that would surrender the black gold. There was little need for any other skills (other than golf and back stabbing) that would propel them to success in any other industry. I sometimes think the same of Stormont. No matter how badly they do, the water will flow, the lights will stay on and the emergency services will (eventually) come. Anything else is a bonus point and if they sink below a certain standard the 'adults' will intervene. Is there any chance we could sort out renewable energy sources or planning law without reverting to 1690? NI21 - perhaps.... we shall see.